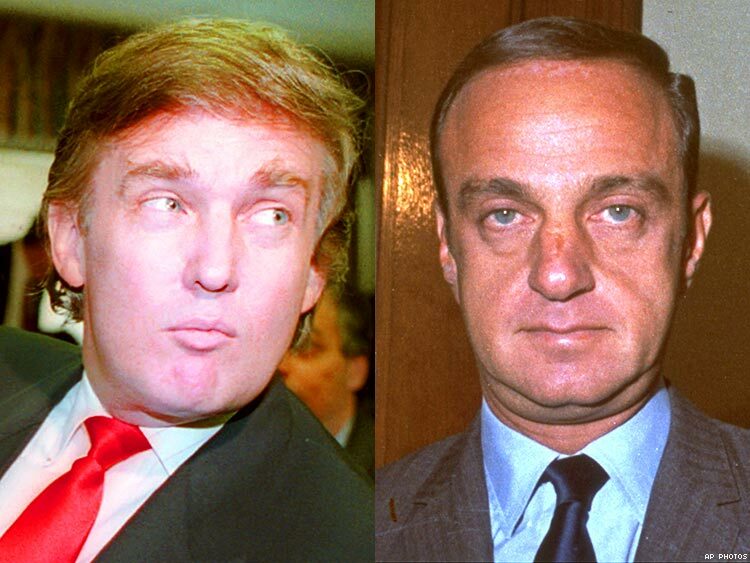 In this election cycle, as many wonder how Donald Trump came to be Donald Trump, at least part of the answer lies in one of his early mentors and close confidantes: the widely reviled, closeted gay hatchet man of the right wing, Roy Cohn. Cohn has been dead since 1986, but the disgraced McCarthyist lawyer — immortalized in Tony Kushner’s acclaimed Angels in America, the musical and miniseries — lives on in the Republican presidential nominee in both style and substance, according to those who’ve studied the two men and their relationship. Dinner companions and party buddies, Trump and Cohn were infamous partners in crime in the New York of the 1970s and ’80s. Cohn, “a Jewish anti-Semite and a homosexual homophobe” (in the words of Politico), was also a trusted legal adviser to Trump and his father, Fred, for many years. Donald Trump still speaks warmly of Cohn today. The Post interview was part of the research for a new book, Trump Revealed, written by Post reporters Michael Kranish and Marc Fisher in collaboration with more than two dozen of the paper’s writers, researchers, and editors. It will be out August 23. But Trump is already revealing his debt to Cohn. The candidate’s call to bar Muslims from immigrating to the United States until their loyalties can be determined has eerie echoes of the most notorious era of Cohn’s career — the 1950s, when as a prosecutor he helped send Julius and Ethel Rosenberg to the electric chair after their conviction for espionage (some observers still contend that Ethel, at least, was innocent), and then aided U.S. Sen. Joseph McCarthy’s hunt for communists in the U.S. government, Hollywood, academia, and elsewhere. The screening Trump proposed includes assuring that Muslim immigrants do not believe in the death penalty for homosexuality, which some deeply conservative Muslims believe is mandated by the religious code known as Sharia law, and which is the punishment prescribed in some countries. Many LGBT activists, however, were quick to call out Trump’s remarks as disingenuous, given that he does not appear concerned that some far-right Christians support the execution of gay people, and that the Republican Party platform is intensely anti-LGBT. Additionally, Trump’s depiction of all Muslims as potential terrorists is reminiscent of McCarthyism. McCarthy and Cohn accused many people who were simply left-wing of being communists, and assumed all communists were involved in subversive activity. Some of their targets had never joined the U.S. Communist Party, some had repudiated it, and at any rate, not all party members wished to help the Soviet Union bring down the U.S. government. Nevertheless, many of the accused saw their careers destroyed. In 1954 the Senate censured McCarthy for his wildest allegations, in addition to other improprieties, and he died in disgrace in 1957. Cohn moved on in his career but remained a loyal supporter of the senator. “I never worked for a better man or a greater cause,” Cohn wrote in his posthumously published, and selective, autobiography. Cohn’s career took him back to his native New York City, where he practiced law for “a client list that ran the gamut from the disreputable to the quasi-reputable,” as the Times notes, until he was disbarred shortly before his death for numerous violations of legal ethics. He represented such famous and infamous clients as mobster Anthony Salerno, New York Yankees owner George Steinbrenner, and socialite Claus von Bulow (although not in either of Von Bulow’s trials for the attempted murder of his wife, Sunny von Bulow). But according to many accounts, Trump was one of Cohn’s favorite clients. They met in 1973, when Trump and his father were facing a suit from the U.S. Department of Justice, alleging that they refused to rent apartments to blacks at the many New York properties they owned or managed. Cohn advised the Trumps to fight back and contended the Justice Department “did not file a lawsuit” but “slapped together a piece of paper for use as a press release.” The Trumps eventually reached a settlement with the DOJ, agreeing not to engage in racial discrimination but never admitting they had. Cohn and Donald Trump continued a close personal and professional relationship up to Cohn’s death at age 59 from AIDS complications. (To the end, Cohn refused to publicly acknowledge being gay, and he even worked against gay causes, such as a civil rights ordinance in New York City.) Early on, Cohn had pegged Trump as a promising young man, saying, “This kid is going to own New York someday,” according to the Times. The lawyer assisted Trump in many of his real estate ventures and in his prenuptial agreement with first wife Ivana Zelnickova. Cohn’s lobbying of Reagan administration officials in the 1980s may have been a key factor in the appointment of Maryanne Barry, Trump’s sister, to a federal judgeship — although even those who cite Barry’s connections note that she has formidable skills. Trump and Cohn dined together often, hobnobbed at Studio 54, and talked on the phone constantly. Perhaps most important for Trump’s political career, Cohn introduced him to Republican activist and conspiracy theorist Roger Stone. Stone is a frequent Trump surrogate on the campaign trail, and over the years he has made statements even more outlandish than Trump’s — accusing the Clinton and Bush families of multiple murders, and using racist and sexist slurs most publications would not print, such as the n word and the c word. Just pushing through, however, won’t win Trump the presidency. But if he wins, Cohn would be pleased, Fraser, who now lives in New Zealand, said in his Times interview. “Having trained or mentored someone who became president, that would have been quite exciting for Roy,” he said. ‹ Music & Market Days: Tom Goss’s Summer In Chicago	› How Do We De-stigmatize HIV But Still Persuade Gay Men to Protect Themselves?